Deb's Cup of Tea: This is just wrong. So I'm going through the coupons in the Labor Day paper and this ad is in them. 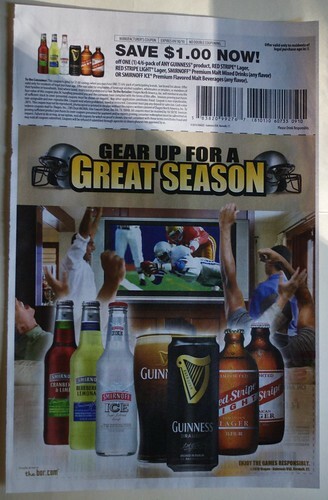 It was one of three different ads inviting you to stock up on libations as football season has started. That's fine but the beverage in the center of the ad. That's...that's Guinness! Guinness beer. Brewed in Ireland since the 18th century. Not really available in the US until 1980's. Guinness; the beer people ask if you "chew it" instead of drinking it. Until Belhaven and other Scottish beers became more easily available, I drank Guinness because I like a beer with flavor. A coupon good for a dollar off? This is too much. First, they start canning it. Canned beer does not have the same flavor as bottled beer. Then, you slap on the side of the can, some nonsense about needing to keep this beer cold. Guinness is NOT served cold. It is best served at "cellar" temperature. This advice comes from when keeping a new batch of beer from going bad meant keep it in the cellar which was a constant 55 degrees. That's not chilled and certainly not cold. To me, this is distressing. It seems Guinness has "dumbed down" their beer. In the never-ending quest for money, they have stooped to that wholly American lure, the coupon. Guinness isn't for everyone, guys. Will I use the coupon? I saved it, but I have been trotting over to Binny's Beverage Depot when I have the funds, and buying Scottish beers for they have an ample supply. So, I don't know if I actually will buy some Guinness or just recycle this bit of paper with the rest of the newspapers. It seems sad to me. Guinness is as mainstream as Coors, who had a coupon in the flyer. I think I'll open a bottle of Old Engine Oil and toast to a time when Guinness meant rare.